Japan’s best-known street food: takoyaki, pan-fried batter balls filled with bits of baby octopus. Takoyaki are a product of Osaka in the 1930s, then spread to greater south-central Japan and beyond. One of those beyonds is now Temescal, aka Lower Rockridge (depending on whether you rent or own). 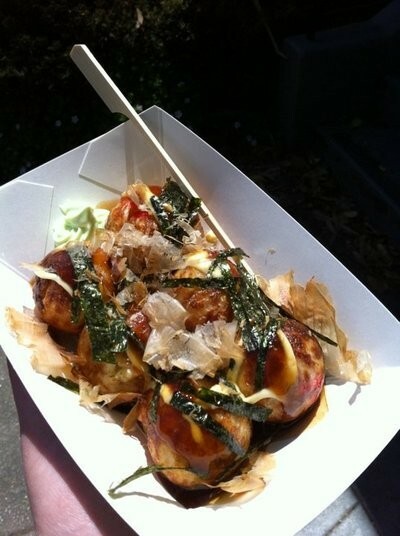 Sundays, when the Temescal farmers’ market takes over the DMV parking lots, a couple of friends have begun selling takoyaki from a sidewalk table outside a house at 491 Cavour Street between Claremont and Redondo, directly across from the market, 10 a.m.-1 p.m. They call themselves Takoyaki Yum. Mei and Teppei use a cast-iron takoyaki pan with a dozen dumpling wells set onto a portable butane burner. If you’ve never seen takoyaki being made, it’s sort of a trip: the thin batter swells as it cooks, and if you poke them around the dumpling wells with a chopstick or skewer, you can achieve a perfectly ball-shaped dumpling, like a Danish ebelskiver — an ebelskiver filled with bits of diced, poached octopus, pickled ginger, and scallion. Teppei sources octopus from Koreana Plaza on Telegraph, and uses the poaching liquid to make the batter. He squirt-bottles the finished balls (three for $4) with Kewpie mayonnaise, sweet-thick okonomiyaki sauce, and wasabi mayo (though you can get that on the side), then a flurry of shaved bonito flakes (katsuobushi) and dried seaweed. They’re tasty: chewy, salty, sharp from the ginger, marine-like from the bits of octopus, which is convincingly fresh. And if you hit up Takoyaki Yum before you slip into the market, you can find yourself rolling the taste of cephalopod around your Sunday morning mouth before you’ve had your Blue Bottle drip.